A great introduction to Port! First Estate Port is a soft and glorious. It is an outstanding vintage character blend, made at the very first property purchased by the company, Lugar das Lages, in 1744. Rich, fruity and elegant, it is aged for four years in cask and is ready for drinking immediately. As enjoyable before a meal as after. 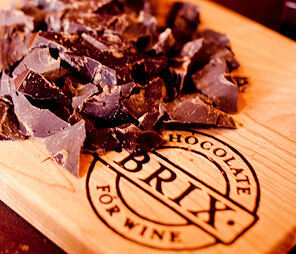 Partnered with a 200g slab of Premium Brix Chocolate, a perfect partner for the Port. Rich, fruity and elegant. Very distinct. Supple, luscious in texture and well balanced. A full bodied, traditional port made in the classic, traditional port style. Taylor's First Estate is a superb dessert wine and, like all classic full-bodied ports, its great with all rich cheeses, especially Stilton or Roquefort and is excellent paired with Brix Chocolate. It is ready for drinking immediately, served at room temperature and should not need to be decanted unless the bottle has been kept for some time. About Brix Chocolate: History ... Dr. Nick Proia, an Ohio pulmonologist, developed Brix when it became obvious to him that no chocolate on the market paired well with wine. Nick and his colleagues would get together monthly to share a few great bottles and friends would usually bring an appropriate cheese to enjoy with their favorite red. It seemed foolish to Dr. Proia to eat these fat-laden cheeses, after dinner, while trying to benefit from the health effects of wines. Instead, Dr. Proia decided to try out the pairing of dark chocolate with wine and after trying all different varieties and “strengths”, he could find no happy medium. Either the chocolate was too much like eating candy or it was so bitter and complex that it would dominate a fine wine. After a good deal of trial and error, Dr. Proia crafted the three blends of what would later be called Brix – the first chocolate specifically blended to compliment wine. At their root is single origin Ghanaian chocolate, known for its red fruit tones, mixed with the highest quality confectionary chocolate. The result is a blend so pure in flavor that it actually enhances those nuances found in great wines, without confusing the palate. Whats it taste like ... Brix Chocolate is pure in flavour. It enhances the nuances found in great wines, without confusing the palate. This smooth dark chocolate has been specially selected to pair with Taylors First Estate, sharing a mutual richness and complexity.